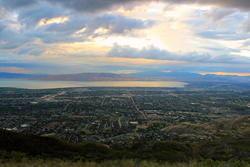 RANLife Real Estate sees a hot 2015 Utah real estate market unfold as Provo, Utah was ranked as the second best housing market to invest in during 2015 according to a report that was first published in Forbes magazine on 1/9/2015. Not one but two cities in Utah made the list of the Top 20 Housing Markets in the United States to invest in during 2015. Britton Sharp RANLife Real Estate's principal broker states, "We have already seen a drastic increase in real estate transactions in first quarter of 2015 and believe that Utah will continue to outperform other markets. RANLife Real Estate is on track to significantly increase prior year's production. We started 2015 with a record breaking first quarter." Provo, Utah was ranked as the second best housing market to invest in during 2015, with a current average home price of around $211,000. A number of factors were said to contribute to this boom in the area, including the stunning population growth the area experienced from 2010 to 2013 and the annual job growth of 3 percent during the same period of time. The population growth in Utah during 2010 to 2013 alone was 6.2 percent per year. Salt Lake City also made the list of the top markets to invest in, although it came in a bit lower at number 12. The average home price in that area is currently around $250,000. The annual job growth for Salt Lake City is also a bit lower than Provo, coming in at around 2.9 percent. People who are interested in dipping their toe into the real estate investment market by purchasing some rental properties or just looking for the best area of the country for finding your first home, along the Wasatch front in Utah is undoubtedly one of the top places that you should be looking, according to the experts at Forbes. For more information contact the experts at RANLife Real Estate, Inc. and RANLife Home Loans.